Uber has struck a deal to buy up to 24,000 self-driving cars from Volvo. The agreement envisages that the pick-up service will purchase the vehicles over the course of three years beginning in 2019. Uber began testing prototypes made by the carmaker last year in the US. One expert said the announcement "makes a good headline" but had doubts that fully autonomous, driverless Uber rides would be ready to begin until some years later. Uber and Volvo have not disclosed financial terms, but have confirmed that the deal is "non-exclusive" - meaning both are free to form similar partnerships with others. "Our aim is to be the supplier of choice for autonomous driving ride-sharing service providers globally," said Volvo in a statement. Chinese company Geely bought Volvo from Ford in 2010. 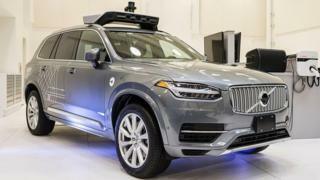 Assuming Uber buys all 24,000 XC90 sports utility vehicles (SUVs) outlined in the agreement, the deal could be worth $1.4bn (£1.1bn), according to an estimate by the Financial Times. Under their pre-existing agreement, Uber already uses various customised Volvo vehicles - which include some of the carmaker's own self-drive hardware - and then adds on its own proprietary artificial intelligence technologies. At present, tests are limited to Tempe, Arizona and Pittsburgh. But the new agreement seeks to radically expand the scale of the operation. "The issue is that we don't have any legislation in any city of the world that would remotely allow this sort of thing to happen at the moment," said Paul Newton, director at the consultancy IHS Automotive, about the idea of a totally driverless taxi service. "We're expecting Japan to be one of the first to allow 'level four' automation - where you have the vehicle doing most of the work but still need a human with steering controls in the driving seat. "But 'level five' - where it's a completely autonomous vehicle in every sense of the word - is less likely to be around in this timeframe." He added that even if the technology were ready in the next five years, new laws and infrastructure would probably take longer to put in place. Uber's self-drive ambitions may also be delayed by a legal dispute with Waymo - a self-drive business owned by Google-parent Alphabet. Waymo claims Uber benefited from the theft of some of its trade secrets and is seeking about $1.9bn (£1.4bn) in damages. The case is due to go to court in San Francisco in early December.